I needed a simple bench for banquette seating in my dining room and I couldn't find one that would work with my dining room table so I thought it would be fun to make one out of 3/4" MDF. I had all my pieces cut at the hardware store so all I had to do was put the pieces together. 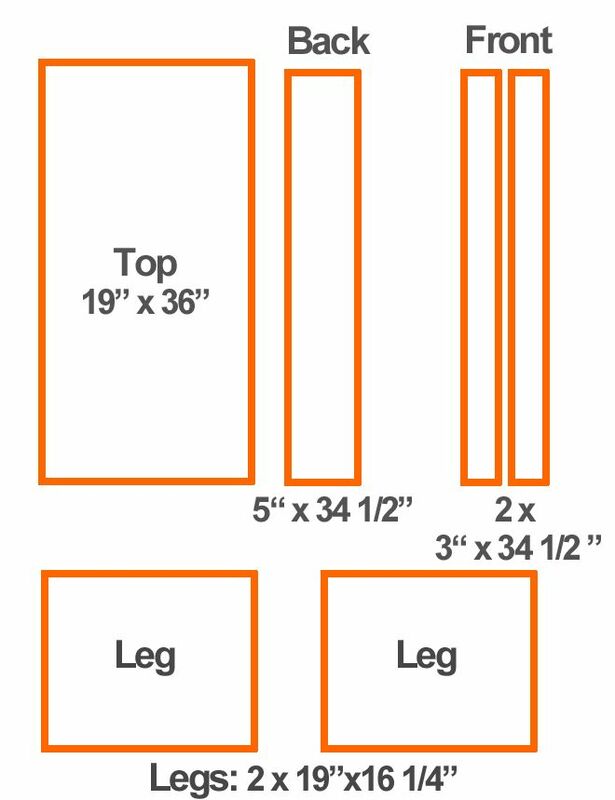 I used 1 x 4'x8' sheet of 3/4" MDF because I needed the rest of the MDF for another project but you can fit the pieces for the bench in 2 x 2'x4' sheets ($25) and the lattice was about $5 so that's $30 for the materials. I already had the primer, paint, and screws on hand. To have more support at the front of the bench, I glued together 2 MDF pieces to make one thicker piece, using clamps to make sure they bonded very well together. I wanted the front piece to be recessed by about 1 inch so I used a combination square to mark the location of the front piece on the inside of the legs, making it easy to slide front piece in the right spot. I added glue to the edge and clamped it. I screwed it into place from the top and the side, making sure to avoid the screw that was already there from joining the top to the legs. To give a little bit more interest to the sides of the bench, I added decorative molding made with 1 1/4" lattice. I used a combination square to mark the location of the top piece of lattice, and I also marked the middle of the lattice piece, making it easy to nail exactly in the right spot. I pre-nailed the nails into the lattice to save my fingers!